When the song was over, they were presented with their own Alef Bet books that they had made throughout the year. In addition to this, their teacher gave them an award from Alef Betty certifying that they were now ready to learn to read Hebrew! 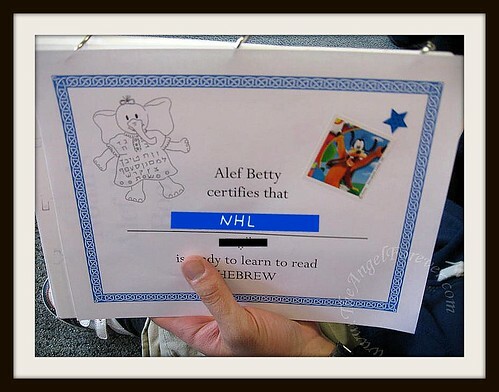 Unlike my experience at Hebrew school, NHL loves it and is eager to go back each week. I hope this continues as we add on another day next year and beyond until his Bar Mitzvah down the road. How cooool! Conga Rats, NHL! You’re awesome! And I LOVE your “hat” (don’t know what it’s called). 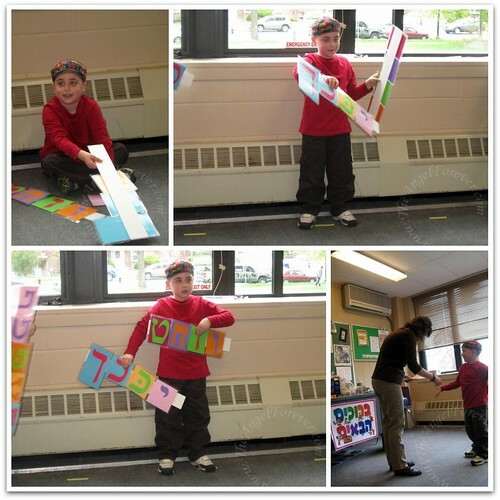 Is Hebrew School something all Jewish children go to, or is it an optional thing? I bet that’s really neat. I wanna go, too! That’s so cool of NHL! Great work, guy!